Working Spark Theatre is looking for a Cultural Consultant to help us out with our upcoming production of Michelle Deines’ play Ghosts in Baghdad, which will take place between March 24-April of 2014 at Little Mountain Theatre in Vancouver. The Cultural Consultant will work with primarily with the playwright and director to ensure that the portrayal of the Iraqi culture in the play is accurate. Interested, or know anyone who might be? There’s an honorarium in it for the right person. Deadline is Friday, November 8 at 5:00pm. Click here to for details on how to apply for the position of Cultural Consultant. 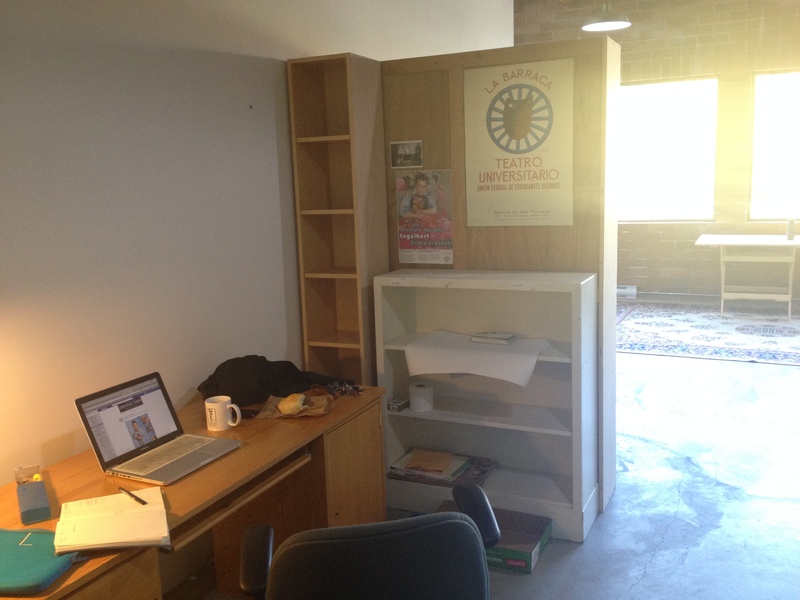 In other news, Working Spark now has our own space! We’ve moved into the Hub at Playwrights Theatre Centre’s new space at 739 Gore Avenue, where we share space with some other fabulous folks, including Zee Zee Theatre, and Horseshoes and Hand Grenades. Working Spark Theatre’s desk in The Hub. Tags: Cultural Consultant, Playwrights Theatre Centre, Working Spark Theatre | Permalink.